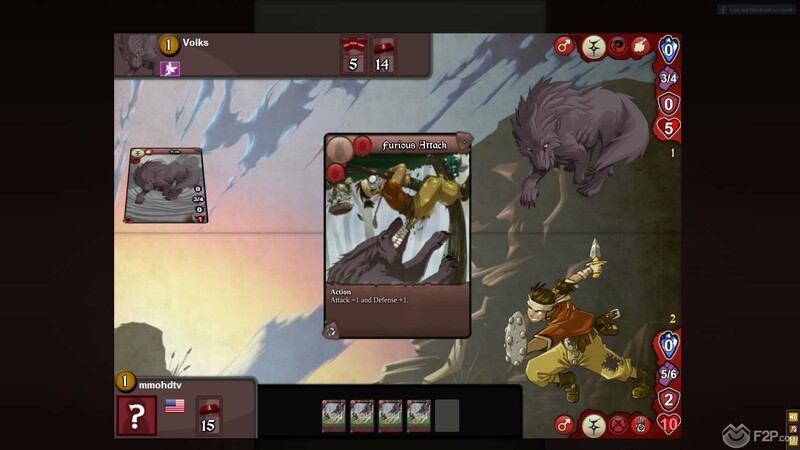 Recently we took some time to jump into Eredan iTCG, the popular free-to-play, browser based MMO TCG developed and published by Feerik back in 2010. 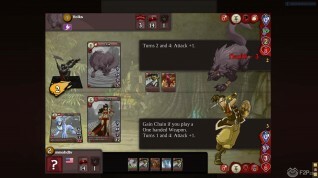 The game offers a unique fantasy based lore, quite original mechanics and a lot of other interesting features, such as a PvE story-based campaign, a marketplace and a clan system (currently in beta). Let's check it out. The registration process, as common in almost every browser game nowadays, is quick and painless. You an access the game directly through Facebook or from the official website with a quick registration or with your Facebook account. Once in the game, you will be welcomed by a tutorial that teaches you the ropes of the game and explains all the core mechanics through a guided fight. This first fight will also serve as an introduction to the game's lore and story-based campaign. 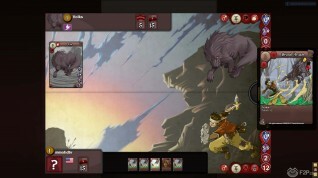 By completing the tutorial you will be rewarded with one of the available starter decks from different options tied to the game's different Guilds/Factions, each one with its very own playstyle, such as Pirates, Kotoba, Desert Nomads, Zil Warriors, etc., for a total of 11 different factions. 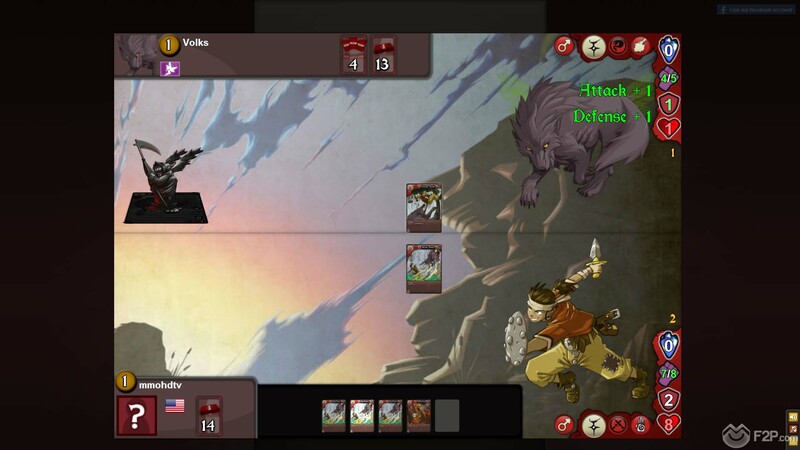 We chose the starter Kotoba deck, a japanese/samurai/ninja inspired faction heavily based on physical attacks and on using items and weapons to equip your characters (mainly warriors) with. Even by browsing the starting decks you can see the effort that developers made in order to create a nice and convincing lore, with interesting character styles, color palettes and art styles that are unique to each faction. 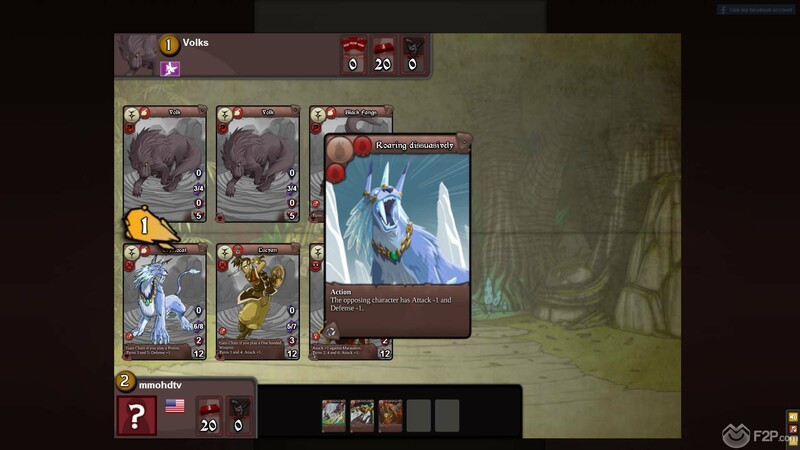 Moreover, even total noobs like us could tell how different the playstyle of every faction is by simply taking a look to the cards that compose the starting decks, with playstyle based on spell cards, cursed items, enemy debuff and more. Very interesting and very promising. Speaking about gameplay, Eredan takes a quite different road compared to many other online TCGs. Instead of playing many creature/heroes cards from your hands, in Eredan you will have only 3 heroes/characters that will be simultaneously in game from the beginning of the fight until they die, and are probably the most important cards in your deck. Each hero card displays its class, guild and level on the upper part, and spirit, attack, defense and life/hp values on the bottom part, plus special abilities listed in the middle (like being more powerful during particular turns, chain effects, etc.). Besides these 3 hero cards, your deck can include spells/items/action cards to use in order to kill the enemy heroes and protect yours. Cards such as spells and actions are single-use cards and will go into your graveyard right after being used, while item cards (weapons, armor, etc.) are permanently attached to your character for that match. Basically when the game begins, the two players (or the player and the AI if you are in PVE mode) will have their three hero cards visible on the battlefield. At this point player one selects the first 2 heroes that will have to fight each other. Then players choose a card (spell, item, action, etc. ) from their randomly drawn hand and play it during that turn. Moreover, players can try to trigger the "chain" effect, to play another card during that turn, for a max of 2 cards played each turn. The "Chain" effect can be simply built into a card; e.g. an action card with the description: "Attack +1, Chain" if played first will boost your character attack by 1 for that turn and will let you chain another card. Our Kotoba characters had the "chain" effect triggered if we equipped them with particular weapons, such as daggers or one-handed swords, and being that our deck was based on equipment and buff actions it was very interesting to build chain combos in different ways. 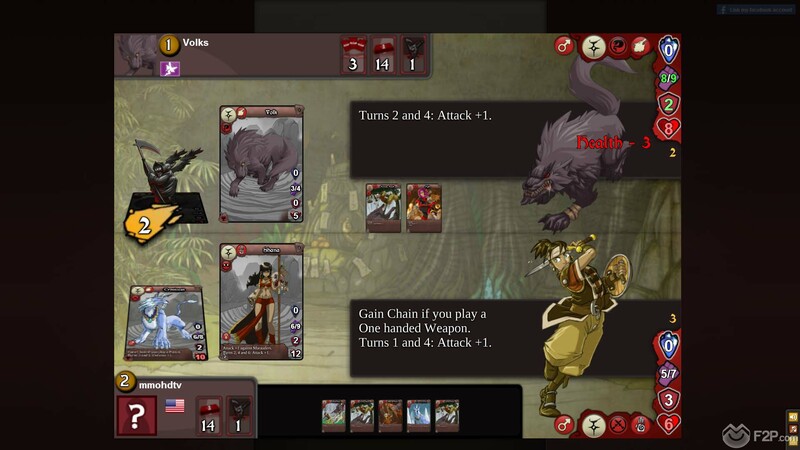 The characters attack each other and inflict an amount of damage to the opponent's HP based on the attack/defense values and on the cards played that turn. The next turn is up to the other player to choose the fighting heroes, and so on. Once a character card's HP drop to 0 or below, that caracter is dead and can't be used anymore. The combat ends when all the three characters of a player are dead. If every character on the battlefield is dead then the winner is calculated based on the damage inflicted/healed HP. After each game, character cards earn XP and once they fill the XP bar they can evolve into more powerful versions of themselves. By winning matches and advancing through the game you will unlock several features such as the marketplace, training, new campaign missions, deck building and more. 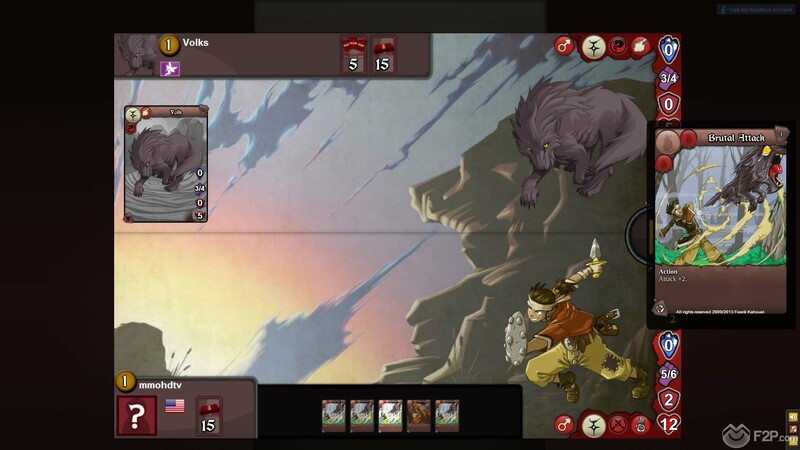 The game graphics are quite good for a browser-based title, and we really liked the polished and detailed card illustration, with a cartoonish-anime style. However, the sound could be better, but not being a very important feature in a game like this, it's not a big problem after all. 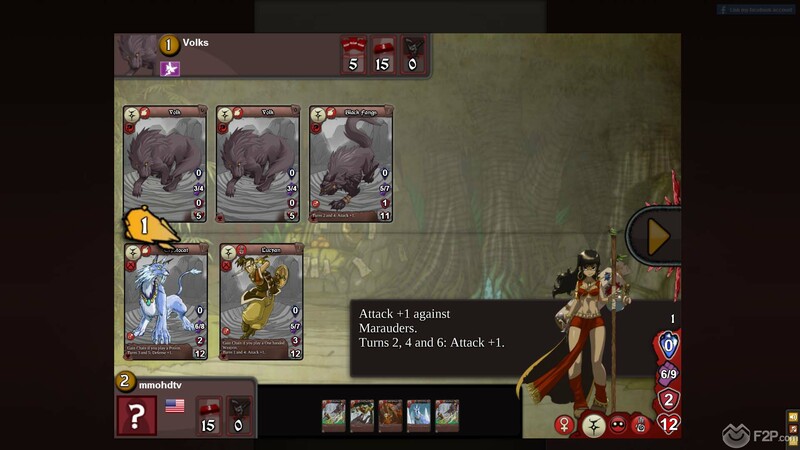 Eredan iTCG is a simple, quick and fun MMO TCG. It offers a fun and addictive gameplay and unique mechanics, deep enough to be challenging and interesting, without being unnecessarily overcomplicated. If you are a TCG fan looking for something appealing for both casual and more experienced players, you could give it a try.